If anyone knows about the irreversible process of cultural colonialism it’s the Irish. That’s why Ireland’s most iconoclastic young Irish theater director Matt Torney is a perfect fit to direct Stop the Tempo, a ferocious new work about displacement and drifting written by Romanian-born playwright Gianina Carbunariu. After the fall of communism in 1989 Romania -- until that point a second tier communist state in the grip of the ruthless dictator Nicolae Ceausescu -- saw itself transformed overnight, becoming a sort of free market Petri dish suddenly brimming with corporations, easy cash, chain stores and chattering media personalities. For Carbunariu, 36, and for her generation Romania became completely unrecognizable. Born and raised in a failed state, she suddenly had to find her way in a flashy new landscape of mindless consumerism and rampant consumer culture. Generations of the Irish have seen Ireland mapped and remapped in endless colonial and cultural expansions that have often led to a similar kind of displacement and fury, and so the play and the author are an ideal fit for Origin Theatre Company, the innovative company with a mission to produce new European works and the producers of the annual 1st Irish Theatre Festival. There are many kinds of theft, but to see your culture and your history purloined in exchange for a bag of shiny baubles (a colonial rite of passage from Romania to Ireland to Manhattan) is particularly searing and results in the most enraged piece of playwriting I have seen this year. Carbunariu isn’t claiming that life in the old communist Romania was better, but she’s full of contempt for what has come to replace it – a society that apparently knows the price of everything and the value of nothing. A nation numbed by the endless cycle of aspiration and fantasy that’s fed to it from its flickering TV screens. A soulless place, a massive supermarket. Torney chose Arlene’s Grocery in the trendy Lower East Side to stage the show (which has just closed, but will open again later in the year). It’s an inspired choice for a production and three characters that flit from club to club in search of contact highs or self-escape. 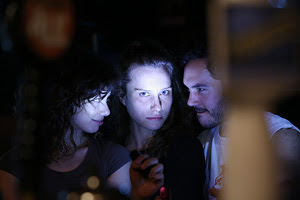 Under Torney’s meticulous direction, actors Olivia Horton, Reuben Barsky and Sarah Silk have formed a perfectly coiled unit to present Carbunariu’s challenging play. In fact they function with more precision and mutual support than I have seen on a New York stage in years. That awareness of and insistence on interdependency is a European theater commonplace, but it’s unusual to see in a New York production where it becomes as political as it is artistic. Carbunariu’s work is, it must be said, quite self-consciously radical at times, trading a little too much on its desire to provoke or shock. There’s something more than a little adolescent about its punk rock nihilism and its thoughtless joy in anarchy. But God knows there’s no doubting its anguish. Behind all its theatrics, its alienation and its last stands is something that disarms you -- its sincerity. Romania once had citizens, and now it has consumers, the playwright informs us. To make his point about how the new capitalistic Romania over-stimulates and hoodwinks consumers with a non-stop barrage of products and services they’re told they’ll almost die without, Torney has crafted a shifting mercurial production that flouts complacency. The three characters in the play, adrift in their personal lives until they find each other, protest their disillusionment with a series of public pranks that quickly escalate into out and out terrorism. But it’s a measure of their inability to affect positive change that they become consumed by their protest whilst forgetting its message. There’s a special poignancy in being part of a transitional generation, as Carbunariu, who cannot return to the Romania she grew up in or find peace in the gaudy new nation she lives in now, well knows. Stop the Tempo laments this fact and is set in the no-mans-land between the two nations. The play offers no solutions because, as Carbunariu points out, it’s already too late for them. Things are as they are now. You make your peace with them or you’re fated to drift, haunting your own life, since you’re literally neither here nor there.